*Corresponding Author: Mohammadhassan Arjmand, Department of clinical Biochemistry, faculty of Medicine, Mashhad University of Medical Sciences, Mashhad, Iran. Background: Prenatal asphyxia or birth asphyxia is the medical situation resulting of deprivation of oxygen to a newborn infant that lasts long enough during the birth process to cause physical harm usually to the brain. Human umbilical cord blood (UCB) is a well-established source of hematopoietic stem/progenitor cells (HSPCs) for allogeneic stem cell transplantation. Low level of O2 in infants with asphyxia during labor can influence on proliferation and differentiation of stem cells in cord blood. Method: The quality and colony forming unit of hematopoietic stem cells in cord blood of infants with severe asphyxia with Apgar score 3-5 or need to cardiac pulmonary resuscitation five minutes after delivery were compared with the normal group with normal Apgar score. Afterward, hematopoietic stem cells were isolated and cells were cultured in enriched media (MethoCult H4435) special for HSPCs for 7 days to assessment growth and colony formation. Results: There was a significant difference in the number of RBC (P=0.0016) and WBC precursor’s colonies (P = 0.006), in plate with 104 cord blood hematopoietic stem cells in infants who exposed to hypoxemia during labor. 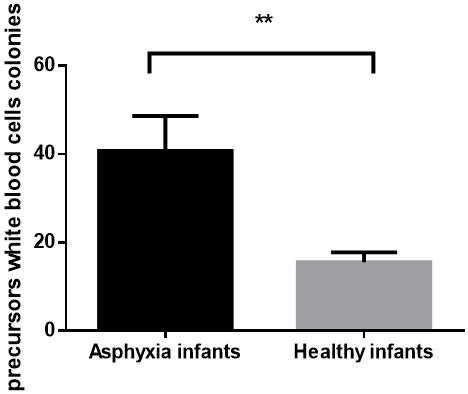 Prenatal asphyxia is a major cause of neonatal mortality and neurological problems . Asphyxia is defined as a mixture of hypoxemia (oxygen deficiency in arterial blood), hypercapnia (is a condition of abnormally elevated carbon dioxide (CO2) levels in the blood), and metabolic acidemia. Apgar score is one of the main criteria for scoring of severe asphyxia. Although the majority of these disorders are transient, severe cases of asphyxia leading to hypoxic ischemic encephalopathy (HIE) which occasionally results in permanent neurological damage, which can finally lead to the palsy of cerebral, epilepsy, and learning disabilities [2,3]. Stem cells of UCB were historically considered an unused product of the birthing process but are now known to have more stem cells than adult bone marrow. When UCB selected for therapeutic use, acute reactions in the host are really low in comparison with other sources of stem cells like Bone Marrow Stem Cells (BMSCs) [4,5]. Autologous intravenous UCB transplantation is safe and possible in young children with obtained neurological disorders, UCB transplantation recovers sensorimotor deficiencies after HIE . Stem cells like HSPCs are really sensitive to oxygen pressure levels and hypoxia. In the other word, low level of oxygen plays the key role in regulation of stem cells and their fate . Expansion and function of the hematopoietic system, self-renewal and maintenance of embryonic stem cells, and differentiation capacity of MSCs are under influence of Hypoxia-induced factor (HIF) mechanism [8-12]. Scientists have demonstrated that when HSPCs cultured at reduced oxygen pressure, they enhanced the potential of self-renewal and in vitro expansion [13-16]. Also, hypoxia can effect on the expansion of Mesenchymal stem cells (MSCs) derived from bone marrow, UCB and amniotic fluid . MSCs derived from UC regulate energy consumption and metabolism during hypoxia and hypoxia leads to an increase in UC -derived MSC growth. Incubation of MSCs derived UC with various concentrations of oxygen led to a rise in cell proliferation at hypoxia condition . UCB is potentially vast precursor of HSPCs for hematopoietic reconstitution which can be clinically used as a reliable alternative for bone marrow transplantation in adults and pediatrics. Serious hematological malignancies such as sickle cell disorders, leukemia, thalassemia immunological defects, bone marrow failure, as well as genetic diseases have considerably treated with cord blood [19-27]. From the first cord blood transplantation in 1988 , have more than 25000 allogeneic cord blood transplantations (ACBT) been performed globally and their results can encouragingly be comparable with the bone marrow as the donor source for transplantations . These achievements demonstrate the role of UCB cells in treatment of human diseases . Today, more than 20% states in USA are involved in educating residents about the importance of cord blood banking and its clinical benefits. Thus, umbilical cord blood banking for autologous and/or allogeneic transplantation and other ongoing purpose seems necessary. The present study has been designed for the first time in order to demonstrate the quality of HSPCs exposed to transient severe hypoxia condition during labor by evaluation the HSPCs colony-forming efficiency, with the aim of whether primary hypoxia can affect the properties and abilities of HSPCs for making colonies even after culture in a normoxia environment and can save in public banks for therapeutic purposes. This study was conducted on 11 infants as an asphyxia group with asphyxia (umbilical blood gases measured, Apgar score 3-5) and ten normal infants with more than 8 Apgar score as a normal group. 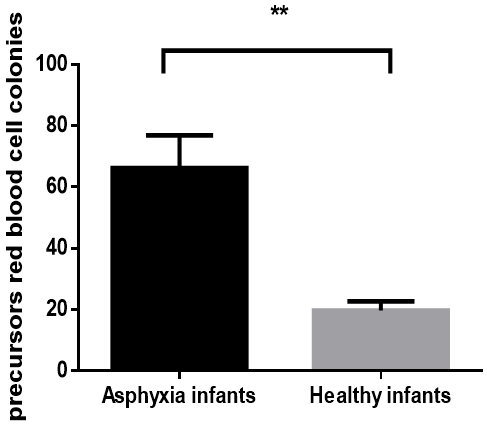 Exclusion criteria for normal infants were any diseases or anomaly and excluding criteria for the asphyxia group was Apgar score more than 5 without severe hypoxia condition. Infant's parents declared their informed consent in writing before participating in the project. This study was confirmed by the Ethical committee of Mashhad University of Medical Sciences. Umbilical cord blood cells collected from Maternity ward of IMAM REZA hospital, Mashhad, Iran between November 2014 and May 2015. Five minutes after infants' delivery, the umbilical cord with 6-8 cm extent of the umbilicus and other side were tied and transected between both sides. Blood was collected from placenta end of cord or by needle aspiration of removed placenta. 15-25cc cord blood was collected and mixed with 5-6cc citrate anticoagulant (Citrate-dextrose solution- C3821-sigma-Aldrich). The maximum elapsed time for transporting the samples to clean room of stem cell laboratory was 30 minutes and they were transferred to the sterile condition. Depending on the sample size, 5-7cc Hydroxyethyl starch 10% (HES 200/0.5) 10% (Fresenius Kabi, 14CA7310) were added to each sample and shacked vigorously. For efficient cells separation and RBC precipitation by HES, the immobilized samples were placed in the sterile laminar class II cabinet. After an hour, the supernatant was removed by sterile syringe and centrifuged at 600g at 25°C for 20 minutes. The progenitor cells were placed on buffy coat layer which was precisely separated by needle immediately after centrifugation. To achieve the required concentrations of progenitor cells, they were counted by trypan blue Neubauer slide . Moreover, samples were evaluated by cell counter (Sysmex XP300, USA) for further investigation. In the 12 wells plates, 1ml of medium special for HSPCs (MethoCult H 4435 enriched, 04445, stem cell technology) , along with 104 progenitor cells obtained from buffy coat layer was plated and 2 wells were cultured with double progenitor cell concentration. The cultured samples were incubated at 37°C, 85% humidity and 5% CO2 for 7 days based on our instruction (Colony Identification Guide)  and previous results. After incubation time, the Colonies were counted by invert microscope. All of cell that calculated were alive. Red colonies were considered as red blood cells precursors and white colonies were considered as precursors of white blood cells (Figure 1). Figure 1A: Red blood cell (erythrocyte) progenitor colonies (×100). B: Separated white blood cell (leukocyte) progenitor colonies (×400). C: White blood cell progenitor colonies (×100). The collected data were entered graph pad prism version 3, Using appropriate descriptive analysis. We used unpaired T-Test while the significance level was considered less than 0.05 with a confidence interval of 95% respectively. The mean of precursor's white blood cells colonies in cord blood of infants with asphyxia exposed to hypoxia was 40.72±7.9 in culture media for 7 days and in infants without asphyxia was 15.5±2.3; therefore the difference was significant (P = 0.006) (graph 1). Also There was a significant difference in mean of number colonies of precursors red blood cells (red colonies) in cultured media for infants who exposed to hypoxemia compare with healthy infants with independent T-Test analysis, 66.2±10.65 versus 16.34±5.1 (P = 0.0019) (graph 2). Graph 1: Number of WBC precursor's colonies in cord blood after culture cells for 7 days in H4435 culture media was significant in infants who exposed to hypoxia following asphyxia compare to healthy infants (P value 0.006). Graph 2: Significant difference of RBC precursor's colonies in cord blood in two groups of infants after culture cells for 7 days in H4435 culture media (P value 0.0019). In the current study, we have reported evidence that the hypoxia resulted from low oxygen pressure in infants with asphyxia increased the HSPCs colony-forming efficiency in in vitro study. Hypoxia is one of the most important environmental factors affecting cells by various ways. Hypoxia plays a significant role in different features of cell biogenesis such as metabolism, migration, proliferation, and differentiation. In this research, the obtained results demonstrate that hypoxia in infants with asphyxia increase the ability of HSPCs to form colonies and have not disadvantaged in viability and quality of HSPCs in culture media, therefore to the best of our knowledge, banking of infants cord blood with asphyxia and severe hypoxia condition has no problem for therapeutic purpose in future. The obtained data showed that the colony-forming efficiency of red blood cells (RBC) and white blood cells (WBC) precursors significantly rose in infants UCB born with asphyxia in comparison to the normal group. Based on Sushmita Roy et al. observation, higher oxygen pressure has potentially been destructive on UCB derived HSPCs whereas under hypoxic condition, the proliferation of UCB derived HSPCs enhanced significantly . We observed the colony-forming efficiency of WBC progenitors were increased 2.62 folds and that of for RBC precursors were elevated 4 folds in infants UCB-HSPCs with Apgar number 5 and less while Roy et al. showed the 27-fold expansion in HSCs under hypoxic condition. Grayson et al. demonstrated that MSCs and HSPCs have progressive growth under 5% O2 during culture and total cell numbers were induced in serial passages . Different studies showed that using low oxygen level has significant influences on the proliferation of cells [35, 36]. Embryonic stem cells have better growth and more proliferation in low level of oxygen in compare with room air. Massive investigations had demonstrated that in asphyxia conditions the nucleated red blood cells (NRBC) were significantly more than the control group [37-39]. Our investigations demonstrate 7 days incubation in 80% humidity, 37oC and 5% carbon dioxide provide the most appropriate condition for UCB derived HSPCs. Based on our observation, after 16 days incubation, more than half expanded colonies showed sign of cell degeneration and when the incubation continued beyond 20 days, almost all colonies destroyed completely. Our represented observations were in the same direction to Nakahata and Ogawa study. They showed when culture condition was continued more than 16 days, some colonies were disintegrated totally and on the day 25 after seeding, just four types of colonies were recognizable . The current pilot study has been designed on limited samples obtained from one hospital, the future studies will be design for complicated population. In fact, using and transplants of UCB over BMSCs has some advantages such as ease of collection, no risk for mother or child, less time needed for processing, less risk for transmission of infection, less need for stringent antigen typing and less rejection risk. Umbilical cord blood is valued for its content of stem cells. There is increasing interest in the use of cord blood for novel indications in regenerative therapy and repair of neurological conditions, including cerebral palsy. Saving the cord blood in public and/or private banks is a qualified undertaking for any family. We report our investigations to increase the public understanding about the positive outcomes of using cord blood banking. Briefly, our investigation demonstrates transient severe asphyxia did not have negative effects on HSPCs to save and banking for likely problems in future. Authors would like thanks from Mashhad University of medical sciences for supporting this project. Boskabadi H, Navaee Boroujeni A, Mostafavi-Toroghi H, Hosseini G, Ghayour-Mobarhan M, Hamidi Alamdari D, et al. (2014).Prooxidant-antioxidant balance in perinatal asphyxia.Indian journal of pediatrics.81(3):248-53. Boskabadi H, Afshari JT, Ghayour-Mobarhan M, Maamouri G, Shakeri MT, Sahebkar A, et al. (2010).Association between serum interleukin-6 levels and severity of perinatal asphyxia.Asian Biomedicine.4(1):79-85. Utomo MT (2011).Risk factors for birth asphyxia.Folia Medica Indonesiana.47(4):211-4. Laughlin MJ, Eapen M, Rubinstein P, Wagner JE, Zhang M-J, Champlin RE, et al. (2004).Outcomes after transplantation of cord blood or bone marrow from unrelated donors in adults with leukemia.New England Journal of Medicine.351(22):2265-75. Rocha V (2004).Acute Leukemia Working Party of European Blood and Marrow Transplant Group; Eurocord-Netcord Registry. Transplants of umbilical-cord blood or bone marrow from unrelated donors in adults with acute leukemia.N Engi J Med.351:2276-85. Sun W, Buzanska L, Domanska?Janik K, Salvi RJ, Stachowiak MK (2005).Voltage?Sensitive and Ligand?Gated Channels in Differentiating Neural Stem–Like Cells Derived from the Nonhematopoietic Fraction of Human Umbilical Cord Blood.Stem Cells.23(7):931-45. Singh RP, Franke K, Wielockx B (2012).Hypoxia-mediated regulation of stem cell fate.High altitude medicine & biology.13(3):162-8. Hawkins KE, Sharp TV, McKay TR (2013).The role of hypoxia in stem cell potency and differentiation.Regenerative medicine.8(6):771-82. Jing D, Wobus M, Poitz DM, Bornhäuser M, Ehninger G, Ordemann R (2012).Oxygen tension plays a critical role in the hematopoietic microenvironment in vitro.Haematologica.97(3):331-9. Lee H-J, Kim K-W (2012).Suppression of HIF-1α by valproic acid sustains self-renewal of mouse embryonic stem cells under hypoxia in vitro.Biomolecules & therapeutics.20(3):280. Fotia C, Massa A, Boriani F, Baldini N, Granchi D (2015).Hypoxia enhances proliferation and stemness of human adipose-derived mesenchymal stem cells.Cytotechnology.67(6):1073-84. Binder BY, Sagun JE, Leach JK (2015).Reduced serum and hypoxic culture conditions enhance the osteogenic potential of human mesenchymal stem cells.Stem Cell Reviews and Reports.11(3):387-93. Tursky ML, Collier FM, Ward AC, Kirkland MA (2012).Systematic investigation of oxygen and growth factors in clinically valid ex vivo expansion of cord blood CD34+ hematopoietic progenitor cells.Cytotherapy.14(6):679-85. Eliasson P, Rehn M, Hammar P, Larsson P, Sirenko O, Flippin LA, et al. (2010).Hypoxia mediates low cell-cycle activity and increases the proportion of long-term–reconstituting hematopoietic stem cells during in vitro culture.Experimental hematology.38(4):301-10. e2. Roy S, Tripathy M, Mathur N, Jain A, Mukhopadhyay A (2012).Hypoxia improves expansion potential of human cord blood–derived hematopoietic stem cells and marrow repopulation efficiency.European journal of haematology.88(5):396-405. Hammoud M, Vlaski M, Duchez P, Chevaleyre J, Lafarge X, Boiron JM, et al. (2012).Combination of low O2 concentration and mesenchymal stromal cells during culture of cord blood CD34+ cells improves the maintenance and proliferative capacity of hematopoietic stem cells.Journal of cellular physiology.227(6):2750-8. Dionigi B, Ahmed A, Pennington EC, Zurakowski D, Fauza DO (2014).A comparative analysis of human mesenchymal stem cell response to hypoxia in vitro: Implications to translational strategies.Journal of pediatric surgery.49(6):915-8. Lavrentieva A, Majore I, Kasper C, Hass R (2010).Effects of hypoxic culture conditions on umbilical cord-derived human mesenchymal stem cells.Cell communication and signaling.8(1):18. Gluckman E, Rocha V. Cord blood transplantation: state of the art. Haematologica; 2009. Frangoul H, Wang L, Harrell Jr F, Manes B, Calder C, Domm J (2010).Unrelated umbilical cord blood transplantation in children with immune deficiency: results of a multicenter study.Bone marrow transplantation.45(2):283. Eapen M, Rubinstein P, Zhang M-J, Stevens C, Kurtzberg J, Scaradavou A, et al. (2007).Outcomes of transplantation of unrelated donor umbilical cord blood and bone marrow in children with acute leukaemia: a comparison study.The Lancet.369(9577):1947-54. Wagner JE, Barker JN, DeFor TE, Baker KS, Blazar BR, Eide C, et al. (2002).Transplantation of unrelated donor umbilical cord blood in 102 patients with malignant and nonmalignant diseases: influence of CD34 cell dose and HLA disparity on treatment-related mortality and survival.Blood.100(5):1611-8. Smythe J, Armitage S, McDonald D, Pamphilon D, Guttridge M, Brown J, et al. (2007).Directed sibling cord blood banking for transplantation: the 10?year experience in the national blood service in England.Stem Cells.25(8):2087-93. Bizzetto R, Bonfim C, Rocha V, Socié G, Locatelli F, Chan K, et al. (2011).Outcomes after related and unrelated umbilical cord blood transplantation for hereditary bone marrow failure syndromes other than Fanconi anemia.haematologica.96(1):134-41. Cohen YC, Scaradavou A, Stevens CE, Rubinstein P, Gluckman E, Rocha V, et al. (2011).Factors affecting mortality following myeloablative cord blood transplantation in adults: a pooled analysis of three international registries.Bone marrow transplantation.46(1):70. Eapen M, Rocha V, Sanz G, Scaradavou A, Zhang M-J, Arcese W, et al. (2010).Effect of graft source on unrelated donor haemopoietic stem-cell transplantation in adults with acute leukaemia: a retrospective analysis.The lancet oncology.11(7):653-60. Kurtzberg J, Prasad VK, Carter SL, Wagner JE, Baxter-Lowe LA, Wall D, et al. (2008).Results of the Cord Blood Transplantation Study (COBLT): clinical outcomes of unrelated donor umbilical cord blood transplantation in pediatric patients with hematologic malignancies.Blood. Gluckman E, Broxmeyer HE, Auerbach AD, Friedman HS, Douglas GW, Devergie A, et al. (1989).Hematopoietic reconstitution in a patient with Fanconi's anemia by means of umbilical-cord blood from an HLA-identical sibling.New England Journal of Medicine.321(17):1174-8. Brunstein CG, Miller JS, Cao Q, McKenna DH, Hippen KL, Curtsinger J, et al. (2011).Infusion of ex vivo expanded T regulatory cells in adults transplanted with umbilical cord blood: safety profile and detection kinetics.Blood.117(3):1061-70. Butler MG, Menitove JE (2011).Umbilical cord blood banking: an update.Journal of assisted reproduction and genetics.28(8):669-76. Louis KS, Siegel AC. Cell viability analysis using trypan blue: manual and automated methods. Mammalian cell viability: Springer; 2011. p. 7-12. PREPARE A, BOTTLE M MethoCult™ H4330. Nakahata T, Ogawa M (1982).Hemopoietic colony-forming cells in umbilical cord blood with extensive capability to generate mono-and multipotential hemopoietic progenitors.The Journal of clinical investigation.70(6):1324-8. Grayson WL, Zhao F, Izadpanah R, Bunnell B, Ma T (2006).Effects of hypoxia on human mesenchymal stem cell expansion and plasticity in 3D constructs.Journal of cellular physiology.207(2):331-9. Studer L, Csete M, Lee S-H, Kabbani N, Walikonis J, Wold B, et al. (2000).Enhanced proliferation, survival, and dopaminergic differentiation of CNS precursors in lowered oxygen.Journal of Neuroscience.20(19):7377-83. Ivanovi? Z, Sbarba PD, Trimoreau F, Faucher JL, Praloran V (2000).Primitive human HPCs are better maintained and expanded in vitro at 1 percent oxygen than at 20 percent.Transfusion.40(12):1482-8. Phelan JP, Ahn MO, Korst LM, Martin GI (1995).Nucleated red blood cells: a marker for fetal asphyxia?American Journal of Obstetrics & Gynecology.173(5):1380-4. Korst LM, Phelan JP, Ahn MO, Martin GI (1996).Nucleated red blood cells: an update on the marker for fetal asphyxia.American Journal of Obstetrics & Gynecology.175(4):843-6. Spencer MK, Khong TY, Matthews BL, MacLennan AH (2001).Haematopoietic Indicators of Fetal Metabolic Acidosis.Obstetrical & Gynecological Survey.56(5):264-5. Nombela-Arrieta C, Silberstein LE (2014).The science behind the hypoxic niche of hematopoietic stem and progenitors.ASH Education Program Book.2014(1):542-7. Mohyeldin A, Garzón-Muvdi T, Quiñones-Hinojosa A (2010).Oxygen in stem cell biology: a critical component of the stem cell niche.Cell stem cell.7(2):150-61. Simon MC, Keith B (2008).The role of oxygen availability in embryonic development and stem cell function.Nature reviews Molecular cell biology.9(4):285. Ivanovic Z, Bartolozzi B, Bernabei PA, Cipolleschi MG, Rovida E, Milenkovic P, et al. (2000).Incubation of murine bone marrow cells in hypoxia ensures the maintenance of marrow-repopulating ability together with the expansion of committed progenitors.British journal of haematology.108(2):424-9. Citation: Ahmadshah Farhat, Abolfazl Nosrati-Tirkani., et al. (2019). Asphyxia Condition and Its Effects on Colony Forming Ability of Hematopoietic Stem Cell in Cord Blood for Banking and Therapeutic Uses. Journal of Gynaecology and Paediatric Care 1(1). Copyright: © 2019 Mohammadhassan Arjmand. This is an open-access article distributed under the terms of the Creative Commons Attribution License, which permits unrestricted use, distribution, and reproduction in any medium, provided the original author and source are credited.